File photo from June 2016 of The CAT high-speed ferry. In November, commissioners raised fees for pilots to steer ships, including the ferry, in and out of Portland harbor and Gov. Paul LePage has asked them to resign as a result. PORTLAND, Maine — Gov. Paul LePage has asked the members of the board that oversees the local harbor to resign because of their November decision to increase the minimum fees pilots charge to steer ships in and out of the port. In Dec. 15 letters, LePage chastised the five members of the Portland Board of Harbor Commissioners for approving the fee hike and asked them each to step down because of their “anti-business” views. In November, the board voted unanimously to set the minimum fee that pilots charge to ferry ships through the harbor to the equivalent of $1,077, altering a May decision that had hiked the fee even higher above the longtime minimum of $709. 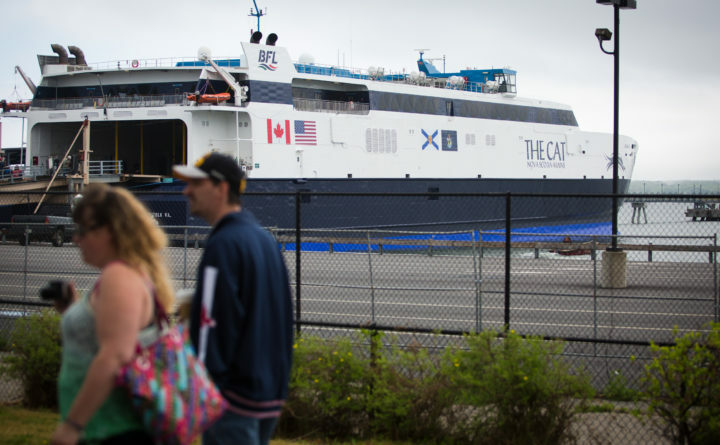 The fee increases were fiercely opposed by the Canadian company that runs The CAT Ferry between Portland and Nova Scotia and lawyers for the company have filed lawsuits to block them, alleging procedural irregularities and a cozy relationship between the pilots and the board. These criticisms, which board members have roundly rejected, were echoed in LePage’s letters. Board Chairman Tom Dobbins said that he and the other board members have no plans to resign. The Board of Harbor Commissioners is composed of two members appointed by Portland’s city council, two more from South Portland, and a fifth appointed by the governor. Dobbins was first appointed by former Gov. John Baldacci and later re-appointed by LePage. “The governor’s mercurial position on pilotage issues has been disappointing to the pilots,” said Twain Braden, a lawyer for the Portland Pilots. A spokeswoman for the governor did not immediately respond to requests for comment Wednesday. Portland’s two active pilots requested the fee increase because, they said, the drop in traffic in and out of the port has hurt their bottom line and forced them to cut staff. But the harbor board has not required that the pilots open their books for a full examination, despite repeated requests from lawyer Harold Pachios, who represents Bay Ferries Ltd.
Pachios provided LePage’s letters to the Bangor Daily News, but otherwise did not comment. The requested resignations were first reported by Munjoy Hill News, a Portland blog. LePage called the fee hike “just another tax increase on businesses.” But the pilots contend that the increase is needed and brings Portland’s pilotage rates into line with those in nearby ports. Minimum fees range from from $2,370 in Searsport to $750 in Portsmouth, according to the pilots. In response to the fee increase, LePage wrote that he will throw his support behind legislation to exempt “certain vessels” from paying pilot fees. On Thursday, the Legislature’s Transportation Committee will hold a first hearing on a bill that would reduce the pilotage requirements on ferries traveling between Portland, Bar Harbor and Nova Scotia. Sponsored by Sen. Mark Dion, D-Portland, the bill would exempt U.S.-flagged ships from taking on a pilot after 15 pilot-assisted trips, while foreign flagged vessels would be exempt after a number of pilot-assisted trips to be determined by a regulatory board. This would essentially restore a state law that, until 2012, exempt ferries calling on Bar Harbor and Portland from having to take on a pilot every time they entered or left state waters. That law was changed in a year when Bay Ferries wasn’t running a route to Maine. Dobbins said the new bill would make it harder to hold foreign-operated ships accountable in the event of an accident.